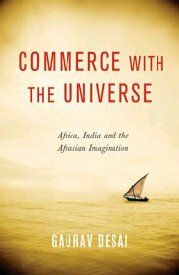 Gaurav Desai’s Commerce with the Universe is a complex, impressively researched, and eminently readable study of literature in an unconventional comparative context. Desai charts new explorations of postcolonial theory, investigating what he calls the Afrasian Imagination across both a “new ocean” and more than eight centuries. Examining the crucial influence of trade and exchange on slavery, colonialism, migration, and globalization while eschewing normative categories of ethnicity and identity, Desai has taken up Paul Gilroy’s challenge to imagine “political culture beyond the color line.” Informed by persuasive and thought-provoking close readings of texts in multiple genres - novels, poetry, essays, and travelogues - and from the East African and Indian sides of the Indian Ocean, Commerce with the Universe shows us both Africa and India from a new perspective. At the same time, Desai’s work offers all comparatists, no matter their geographic or chronological field of study, a compelling model for thinking about global literary, cultural, and political relationships.